Dating from the 1960s, the passenger terminal building at Schiphol Airport has been eulogized for its crystal-clear parti. The arrivals hall occupies the ground floor and the departures hall the floor above. In both, passengers are led through a sequence of parallel zones: entrance, check-in counter, passport control, shops and waiting room. This configuration has been retained in the new Terminal-West. 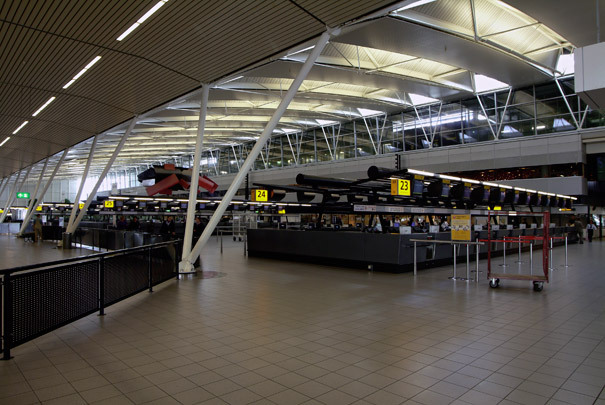 Benthem Crouwel's 150 metre long arrivals and departures hall is of constant section and presided over by an undulating steel roof on V-shaped columns.